Even for Karl Towns Jr.’s lofty standards, his performance for Metuchen (N.J.) St. Joseph School’s basketball team against Jersey City (N.J.) St. Peter’s Prep was pretty remarkable. By game’s end, Towns Jr. had accumulated one of the rarest statistical feats one can encounter: A quadruple double. As noted by the Newark Star-Ledger and USA Today, among other sources, Towns Jr. completed St. Joseph’s 82-66 victory against St. Peter’s with 16 points, 17 rebounds, 11 blocked shots and 11 assists. Just think about that for a second … 11 blocked shots and 11 assists! To put Towns Jr.'s achievement in perspective, there have been just four quadruple doubles in NBA history, and NBA games include an additional 16 minutes of playing time (albeit against much tougher competition). 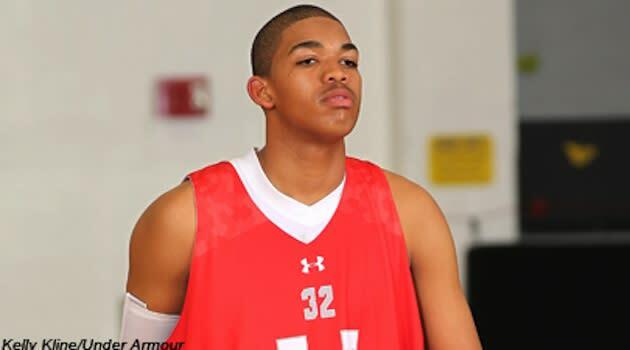 "It was one of the best performances I’ve ever seen,” Towns Jr.’s father, Karl Towns Sr., told USA Today. The remarkable performance was Towns Jr.’s first career quadruple double, though if anyone can achieve a second it might be the 6-foot-10, 225-pounds center, who is completely overpowering in the paint. He gave credence to that belief by following his first career quadruple double with a massive triple double of 23 points, 17 rebounds and another 11 blocks. To this point in his career, Towns Jr. has received most of the attention paid to him for the fact that he is already a vital part of the Dominican Republic’s national basketball team. That may change as soon as he arrives at Kentucky, assuming he remains loyal to his pledge at the school for the Class of 2014. There’s certainly no indication he would head anywhere else, particularly with his Dominican Republic coach, John Calipari, doubling as Kentucky’s head man. No matter what’s next, there’s another year and a half of high school hoops glory ahead for Towns Jr., which is an exciting prospect for fans of watching dominant prep basketball players and horrible news for any team on St. Joseph’s schedule. • Jon Jones' football dilemma — big brother or little brother?